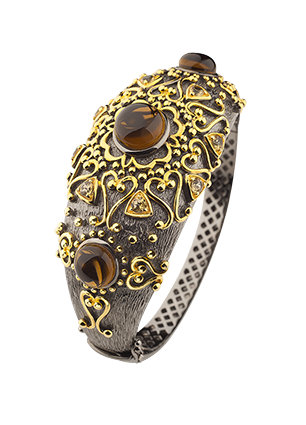 A silver bracelet with an interlaced pattern of gilded metal around a number of smoky quartz crystals. Noble black silver gives this piece of jewellery a vintage look. It goes well with an evening gown made of heavy fabric or with yellow-golden hues.